The dining room is often times a major gathering spot in the home. Whether you eat at the dining room table every night or just for holidays and other special occasions, there’s sure to be many fond memories created around the dining room table. 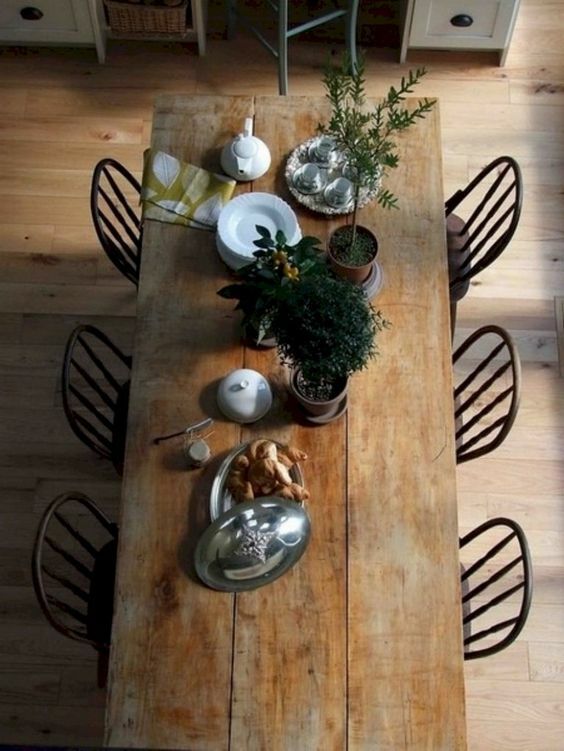 With Thanksgiving right around the corner we’ve had dining room tables on our mind more than usual. A dining room table is often a big investment, and a piece of furniture you’re going to have for many years. So how do you know you’re getting the right one? 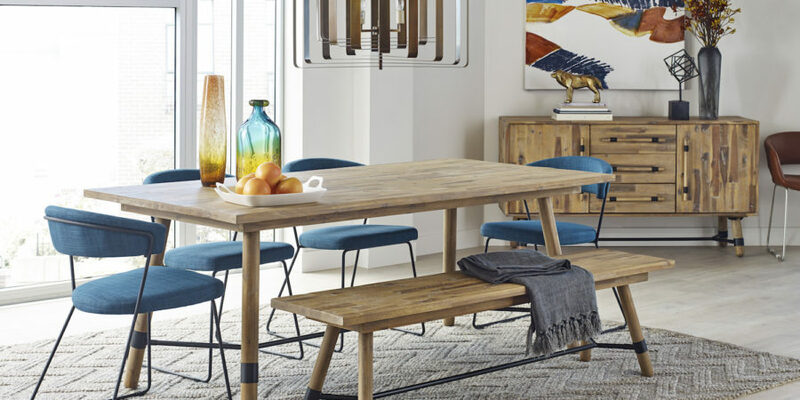 We’ve put together this handy guide to make sure that you get the perfect dining room table for your space. Size is the most important factor when choosing a dining room table. You need to remember that besides the size of the table itself, you need to account for the space around it as well. There should be at least three feet of space on all sides so people can comfortably sit in a chair and move around. It’s also important to know how many people will regularly sit at the table. The general guideline is 22”-24” for each person. If you have a small space but enjoy hosting dinner parties on occasion consider an extendable dining table. 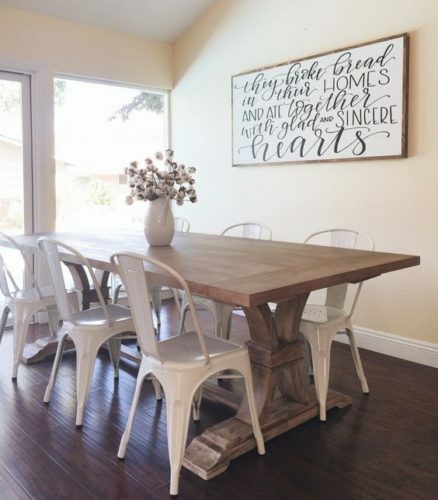 This is especially helpful if the dining table is in a multipurpose room. Just make sure at its largest it still fits in the space. The second biggest factor is the shape of the table. 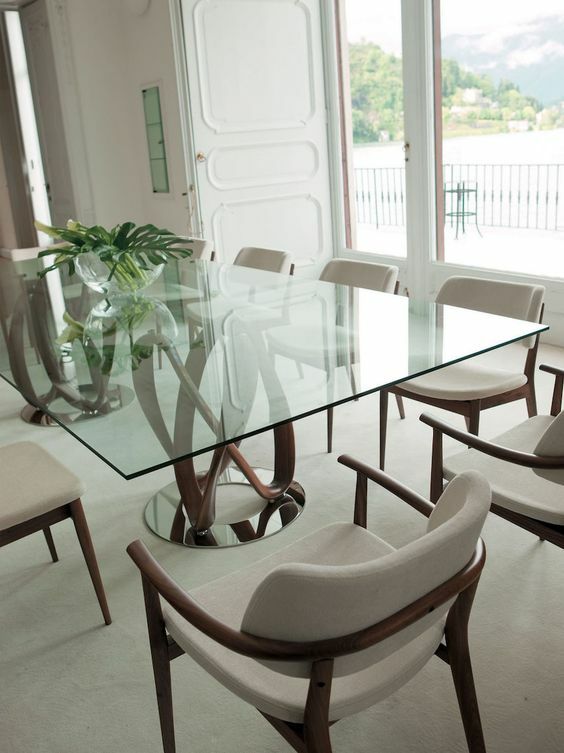 In general the shape of the room will help dictate the shape of the table. For square rooms a square or round table will look good. Rectangular rooms can handle rectangular or oval tables. While a round tables in a rectangular room or rectangular table in a square room may technically fit, it will likely throw off the proportions of the room and just not look right. Round and oval shapes can be a better choice for smaller spaces because there are no sharp corners cutting into the space. 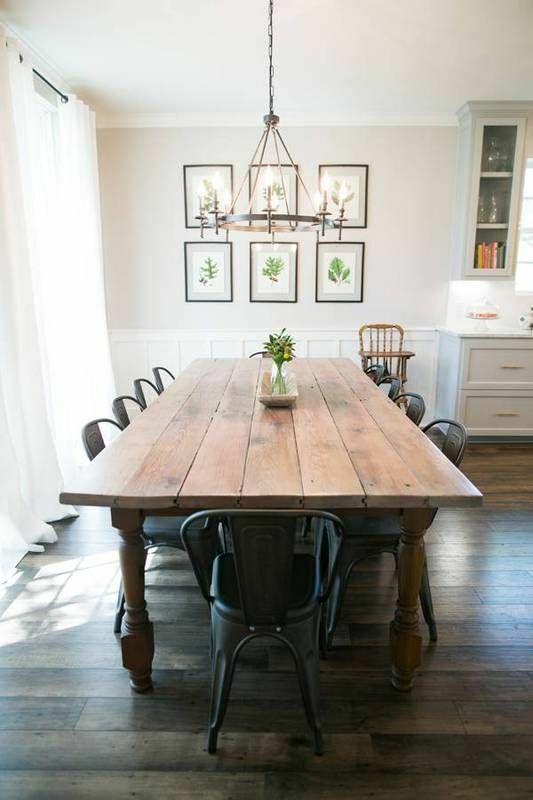 If you want your dining room table to last, it’s important to choose a table made out of sturdy materials. The most common dining room table material is wood. 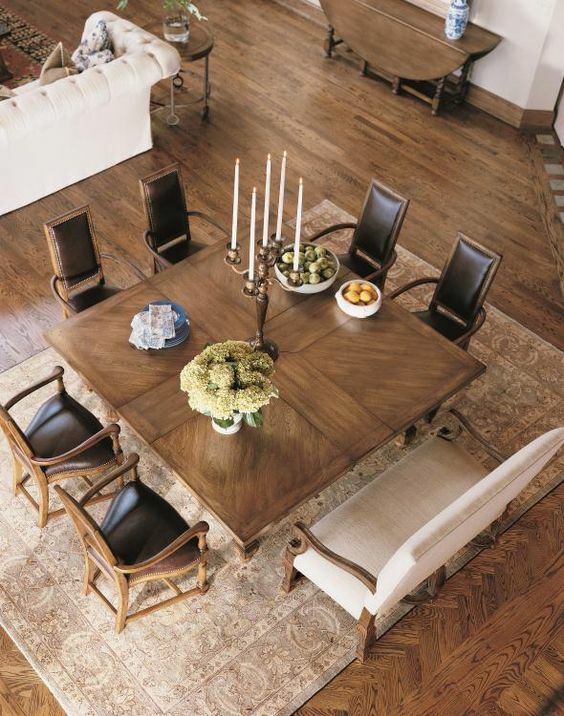 Look for tables made of hardwoods like walnut, maple, oak, mahogany, and teak. Tempered glass can also be solid choice of table top material (no pun intended). Since it’s transparent it can help keep the space more open and visually light than a material you can’t see through. It’s also easy to clean. If you’re going for elegance you can’t beat a marble table. Of the common table materials it requires the most maintenance, but it can be a real show stopper if you’re willing to put in the effort. Related to material, construction is also important. Look for a table with solid joinery. Whatever the material, you want the joints and where things come together to look sturdy and well put together. The type of supports a table has will also make a difference in its appropriateness for your space and situation. 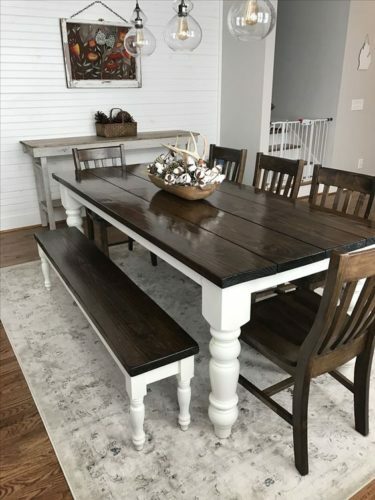 There are three types of table bases – legs, pedestal, and trestle – and the type of base will affect how many people can fit around the table. A pedestal base offers the most flexibility in terms of fitting in extra seats since all of the support is at the center of the table. Trestle bases can provide extra room along the sides but may limit how many people can sit on the ends. 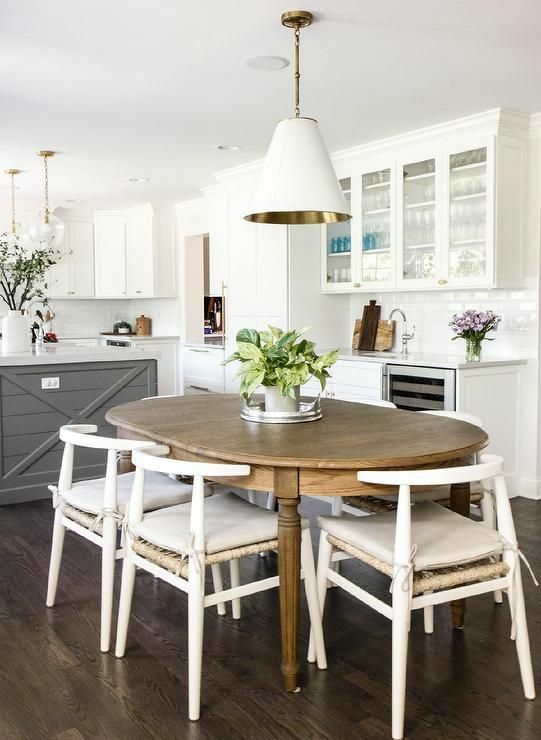 For tables with four legs, pay attention to leg width and their placement as this can have a big impact on how many chairs can fit around the table and where people can comfortably sit. There aren’t really any firm guidelines for what style will work. If the rest of your home has a specific style, look for a table that will match. Try to avoid super trendy looking tables though. A dining room table is too large to switch out every time trends change. It’s a good idea to look for table that has a more timeless style and will look as good in ten years as it does today. 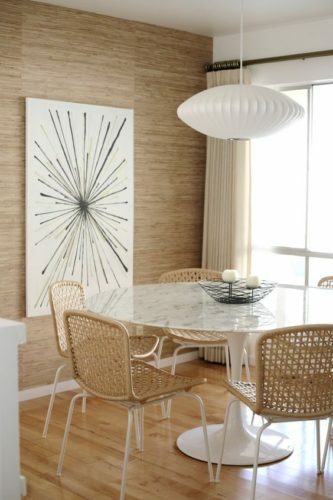 Hopefully by following these basic guidelines you can find the dining room table of your dreams! It can be easy to get overwhelmed by all of the options, but if you know what to look for you can automatically narrow it down by ignoring the tables that don’t fit your needs. Once you have the centerpiece of the dining room set, you can move on to getting the rest of the room in order. If you need anything to complete your dining room, make sure to check out our Thanksgiving sale!